From Goodreads ~ The inspiring and sometimes hilarious story of a family that quit the rat race and left the city to live out their ideals on an organic farm, and ended up building a model for a new kind of agriculture. When Brent Preston, his wife, Gillian, and their two young children left Toronto ten years ago, they arrived on an empty plot of land with no machinery, no money and not much of a clue. Through a decade of grinding toil, they built a real organic farm, one that is profitable, sustainable and their family's sole source of income. Along the way they earned the respect and loyalty of some of the best chefs in North America and created a farm that is a leading light in the good food movement. 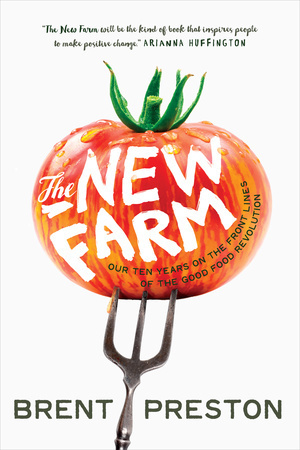 Told with humour and heart in Preston's unflinchingly honest voice, "The New Farm" arrives at a time of unprecedented interest in food and farming, with readers keenly aware of the overwhelming environmental, social and moral costs of our industrial food system. "The New Farm" offers a vision for a hopeful future, a model of agriculture that brings people together around good food, promotes a healthier planet, and celebrates great food and good living. Brent and his wife, Gillian, met in 1994 when they were working in Africa for the National Democratic Institute, an American organization that sought to spread and strengthen democratic government. He was from Toronto and she was from Vermont. 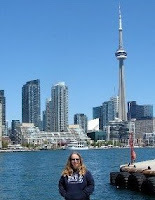 They eventually settled in Toronto, married and had two children. Brent was a producer with CBC and Gillian worked for a public-sector management consulting firm when they decided they wanted to move away from Toronto to the country. Brent and Gillian had bought an old farm in Creemore, about an hour and a half northwest of Toronto, with the intent of having it at as weekend getaway but instead relocated there. With no money and not a lot of experience, they decided they wanted the farm to support them. But they wanted the farm to provide organic produce, something that wasn't heard of in the mid-2000s. Despite having the other farmers in the area think they were crazy and having many lean years in the beginning, The New Farm is now a certified organic farm producing premium quality organic vegetables for restaurants, retail stores and wholesale customers. I liked this book and found it interesting. It goes without saying that there is a lot of work that goes into farming, especially when most of it is done without machinery and staying true to being organic. It re-enforced that it's not something I ever want to do. And as much as I like meat, I couldn't raise animals, get attached to them and then kill and eat them (that was hard to read about). I liked the writing style and found it amusing at times. As a head's up, there is swearing. 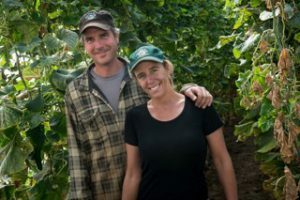 The passion that Brent and Gillian have for the farm, for ensuring it's organic, involving the community, helping worthwhile causes, respecting migrant workers and making a better way of life for their family comes through. It would have been nice if the book had had some pictures so we could see what the farm looks like and how far they've come.